Provides complete and undiluted knowledge on making inorganic polymers functional. This comprehensive book reflects the state of the art in the field of inorganic polymers, based on research conducted by a number of internationally leading research groups working in this area. It covers the synthesis aspects of synthetic inorganic polymers and looks at multiple inorganic monomers as building blocks, which exhibit unprecedented electronic, redox, photo-emissive, magnetic, self-healing and catalytic properties. It also looks at the applications of inorganic polymers in areas such as optoelectronics, energy storage, industrial chemistry, and biology. 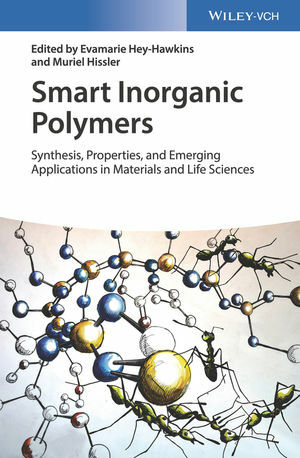 Beginning with an overview of the use of smart inorganic polymers in daily life, Smart Inorganic Polymers: Synthesis, Properties and Emerging Applications in Materials and Life Sciences goes on to study the synthesis, properties, and applications of polymers incorporating different heteroelements such as boron, phosphorus, silicon, germanium, and tin. The book also examines inorganic polymers in flame-retardants, as functional materials, and in biology. Aimed at academics and industrial researchers in this field, Smart Inorganic Polymers: Synthesis, Properties and Emerging Applications in Materials and Life Sciences will also benefit scientists who want to get a better overview on the state-of-the-art of this rapidly advancing area. Evamarie Hey-Hawkins is Full Professor and holds a Chair of Inorganic Chemistry at Leipzig University, Germany. Her broad research interests include biological and medicinal chemistry, homogeneous catalysis with transition metal complexes, and precursors for novel materials. She was Chair of the COST Action CM1302, the European Network on Smart Inorganic Polymers (SIPs), and has received numerous awards from international chemical societies and the Order of Merit of the Free State of Saxony, Germany, in May 2017. Muriel Hissler is Full Professor of Chemistry at the Institute of Chemical Sciences of the University of Rennes, France. Her research activities are mainly directed towards the synthesis of heteroatom-based pi-conjugated oligomers or polymers having physical properties useful for optoelectronic applications. She was Vice Chair and Short Term Scientific Missions (STSM) coordinator within the COST Action CM1302. She received the prize of the Division of Coordination Chemistry of the French Chemical Society and she is a member of the Institut Universitaire de France.